Twin sisters Tatum and Taylor Edwards were softball stars at the University of Nebraska, before they joined the pro ranks with National Pro Fastpitch. Both eventually joined the Chicago Bandits, where they were a big part of championships in 2015 and 2016. They were two of my favorite players. Taylor was traded to the Scrap Yard Dawgs after the 2016 season and still plays for them, although they are no longer part of the NPF. Tatum retired after the 2016 season and recently returned to Nebraska as an assistant coach of the softball team. 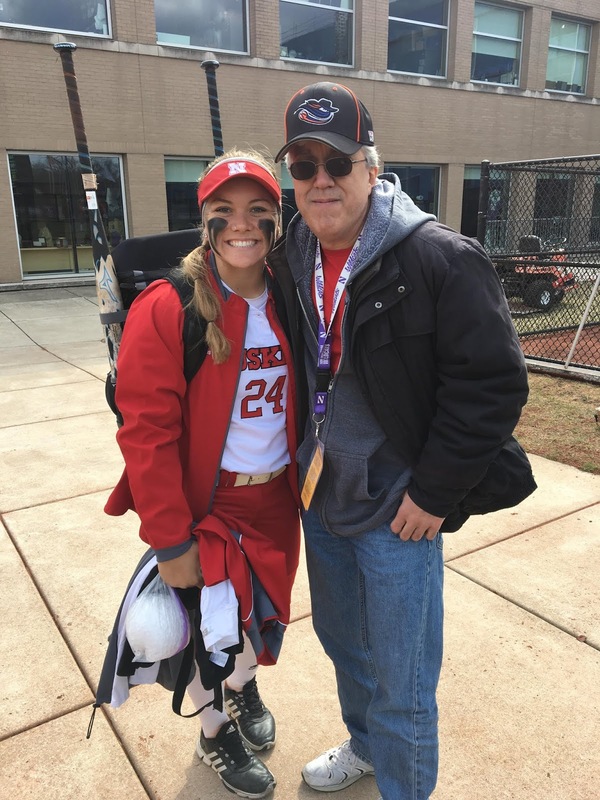 While covering the Northwestern Wildcats softball team, I met a third Edwards sister. Tristen is a star shortstop at Nebraska. When the 2019 season begins, Tristen will be a third year player. The bonds of love and mutual respect between the sisters is evident, although naturally, Tristen wants to create her own legacy. She is well on her way to doing just that, establishing herself as a legit 5 tool player. In 2016, she hit .281 with 4 homers and 25 rbi's. Last season, she improved to .356, with 12 homers and 43 rbi's. I can't wait to see what she does this season. Tristen definitely has a future in pro softball if she chooses to continue. I'd love to see her on the Bandits someday. I have already set a goal of interviewing her in 2019, to complete my Edwards triple play of sorts. For more info on Nebraska softball, head to Huskers Softball. Of course, I'll be following her career and will be reporting here, too! Tristen Edwards and me in Evanston, IL-May 2018.